Since Nagomi Visit received The Japan Foundation Prizes for Global Citizenship from the Japan Foundation, we find ourselves in unexpected situations. Such as on Japan's Ministry of Foreign Affairs of Japan website. The two of us, Nagomi Visit's founder and myself the COO of the organization are standing in the middle of the group photo. To the left is a member of the House of Representatives who spoke at the ceremony. He is part of the Committee of Financial Affairs and all of us at Nagomi Visit including a few hosts had the great honor but a bit surreal experience being able to speak with him. 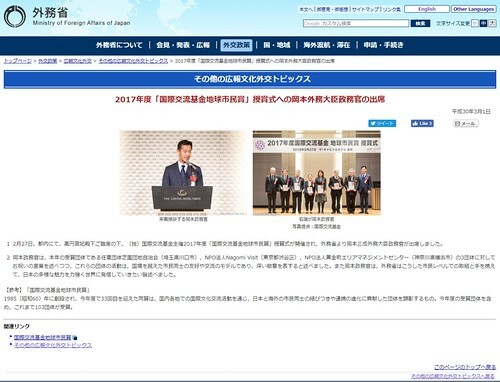 The whole experience of being in an awards ceremony was already very new but who knew we would find ourselves on the Japanese government's website as part of their foreign relations news. It sure is a new day for Nagomi Visit. Arigato again to all our hosts who came to the ceremony to celebrate with us. We also would like to take this opportunity to of course thank everyone who participated as guests. We are just stating an obvious fact but if it weren't for all of you participating we wouldn't be here so, arigato.